Desiccant packets adsorb humidity and eliminate the risk of mildew or rust damage in sealed containers. Non-corrosive montmorillonite clay desiccant. The Tyvek® bags are tear proof and dust free, meeting the MIL-D-3464E specification for lack of dust. Each desiccant packet is individually packaged in 6mil thick poly and heat sealed, giving them a 2 year minimum shelf life until opened. High Capacity: Can adsorb up to 20% of its weight in water. 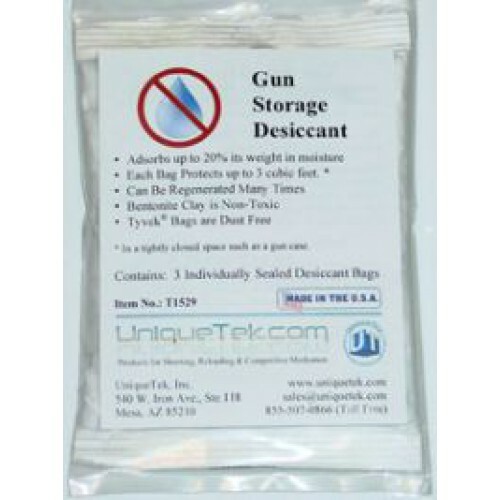 Regenerate and reuse: Desiccant can be regenerated by simply baking in an oven at 245°F for 8 hours. Do not exceed 245°F or damage to the packet may occur. Individually sealed: Only open inner bags immediately before use. For the gun case: One packet is the ideal size for most portable gun cases. For the gun safe: Each packet is rated to protect 3.3 cubic feet of space. For a typical gun safe, use 6 packets placed in various areas. 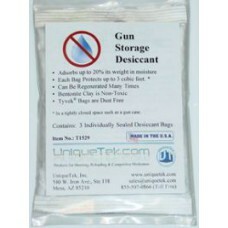 Includes 3 desiccant packet per pack.